The FV430 series of vehicles has a long pedigree which can be traced back to the origins of the famous WW II bren gun carriers/universal carriers. 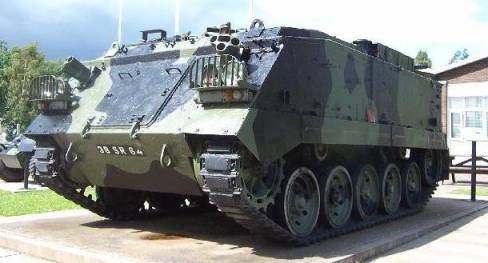 The immediate predecessors of the FV430 series were the FV420 series, themselves developed from these carriers. 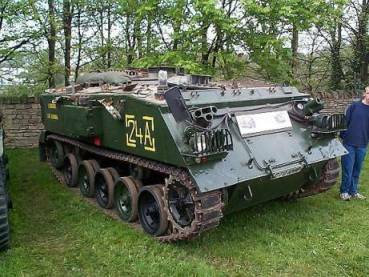 The prototype vehicle, FV431, provided the basis for the FV432. FV432 is essntially a steel box on tracks. It was built by GKN Sankey and production finished in 1971. There are four basic marks, Mk 1, Mk 1/1, Mk 2, and Mk 2/1. The Mark 1 had a roof mounted exhaust. 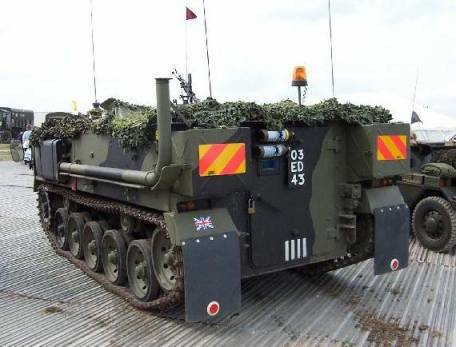 The Mark 2s are identifiable by the prominent exhaust on the LH side of the vehicle..
Each of these versions essentially involves a simple refit of the basic vehicle. The most common version is with a GPMG turret. 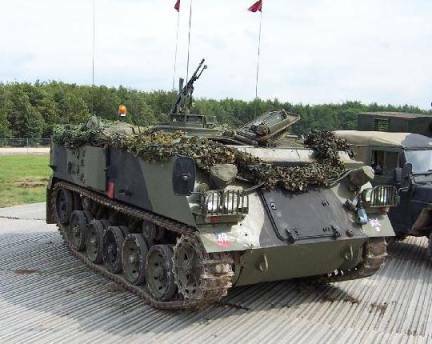 There are also vehicles used by the Berlin Garrison with 30 mm Rarden turrets, as well as some vehicles fitted with Scorpion turrets for use as Opposing Force (OPFOR) vehicles in exercises. Distinguished by a extensive roof racking and large box-like awning on the top rear of some vehicles. Box like structure on roof. Lots of aerials. Engineering vehicle with crane jib and open top. FV432 variants with Green Archer, MSTAR or ZB298 battlefield radars, or later, Cymbeline mortar location radar. Subsequently modified for command and control purposes. This had roof mounted generators and air conditioning equipment. Wavell is a battlefield computerised data management system (Automatic Data Processing = ADP). Ptarmigan is a battlefield communication system.